Damn, Can We Let Malia Obama Live? Over the weekend, the Internet was outraged that Malia Obama decided to go to the annual music festival Lollapalooza instead of the Democratic Nation Convention. Let's be honest here, Malia is an 18-year-old teenager. As a teenager myself, I would have preferred a music festival over the DNC. The problem is people hold Malia to such high standards, because of course she is the daughter of the president of the United States and also because she is black. Mainly the people outraged about her having fun are Republicans. Many conservatives find any reason to criticize the Obama family -- whether it's Obama's failure to fulfill many of the promises he made, Michelle Obama's appearance and now the behavior of their children. Black people have to work 10 times harder to get the same things white people have -- one of them being respect. These complaints are always unwarranted and laced with racist undertones. Never before have they put so much pressure on such a president over things so unrelated to what's important... like politics. Black people have to work 10 times harder to get the same things white people have -- one of them being respect. Malia has always been meek alongside her dad during his entire presidency. She has lived up to the standard of a good presidential daughter. She decides to have fun one time, and people are up in arms about it. She has always worked hard to have an admirable reputation. It shouldn't be overshadowed by her enjoying herself at a music festival. Dear Sasha and Malia, I get you're both in those awful teen years, but you're a part of the First Family, try showing a little class. Rise to the occasion. Act like being in the White House matters to you. Dress like you deserve respect, not a spot at a bar. This statement was met with criticism, and she resigned. People hold Obama's daughters to a standards that not even the past children of the prior presidents could achieve. People hold Obama's daughters to a standards that not even the past children of the prior presidents could achieve. 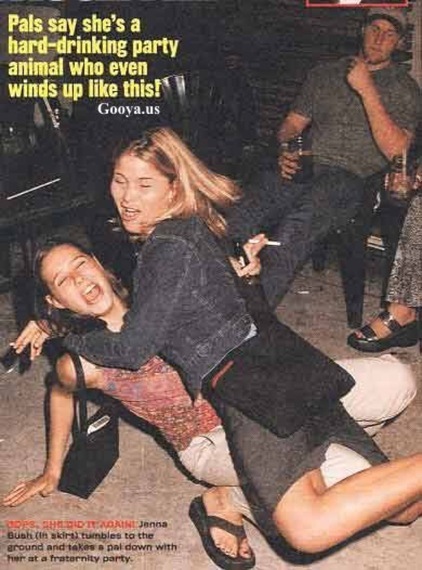 During George Bush's presidency, his daughters Jenna and Barbara Bush had a reputation for being unruly party animals. Photos of Jenna drunk and on the floor would circulate on the internet. In 2001, Jenna Bush was charged with an underage drinking charge at 19 years old. Many regarded them as Secret Service nightmares. Yet the Republicans weren't outraged about this. The media now is too busy trying to vilify Malia Obama, who has always been a classy young lady. Malia is at the same age as the Bush girls were, and she has not done any of the things that they have done. Malia never asked to be in the spotlight. At a young age she was thrusted into the spotlight when her father announced his presidency. Since then she hasn't been able to get much privacy. During her college visits last year, a photo circulated of her playing beer pong. As a teenager that's a time-honored tradition. The outrage was unwarranted. It seems that anytime Malia is actually enjoying herself, people are outraged. There's no reason why Malia should be viewed as a puppet. She is her own person; she isn't Barack and she isn't the White House. She shouldn't be viewed in such a way. She is on her way to Harvard next fall -- an accomplishment many wish they could achieve. She has a good head on her shoulders and parents who have taught her so much class. Malia is at the same age as the Bush girls were, and she has not done any of the things that they have done. Yes, Malia is the daughter of the president of the United States, but before that she is a teenager. She shouldn't be hindered from enjoying herself because of who her father is. She shouldn't be confined to a cage just to appease others. Malia is an adult now, at 18 years old, she is able to make her own decisions and we should respect that. Damn, can we let Malia Obama live?